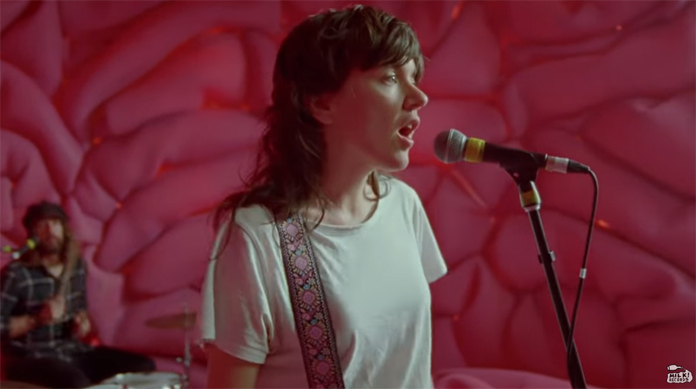 Australian singer/songwriter/guitarist Courtney Barnett released a new album, Tell Me How You Really Feel, back in May 2018 via Mom + Pop/Marathon Artists/Milk! Records (it was our Album of the Week and one our Top 100 Albums of 2018). For this past Saturday's Record Store Day Barnett released a new 7-inch single "Everybody Here Hates You" and now she has shared a video for the song. Danny Cohen directed the video, which finds Barnett and her band performing in a giant brain. Watch it below, followed by her upcoming tour dates. Read our 2018 cover story on Courtney Barnett here. Read our 2017 interview with Courtney Barnett and Kurt Vile on Lotta Sea Lice. Barnett released her debut full-length album, Sometimes I Sit and Think, and Sometimes I Just Sit, via Mom + Pop in 2015 and it landed at #6 on Under the Radar's Top 100 Albums of 2015 list. Also read our joint interview between Barnett and Wilco's Jeff Tweedy, from our Best of 2015 issue.